Is your PC suffering from old age? Is it taking a long time to boot? Are websites running slow and you can’t play games anymore? Once there, click on the Speed Up tile to start speeding up your PC. If your PC is constantly busy doing something even when you’re not, or you get lots of annoying balloon tips, then it’s time to put background programs on “standby” mode with Program Deactivator. 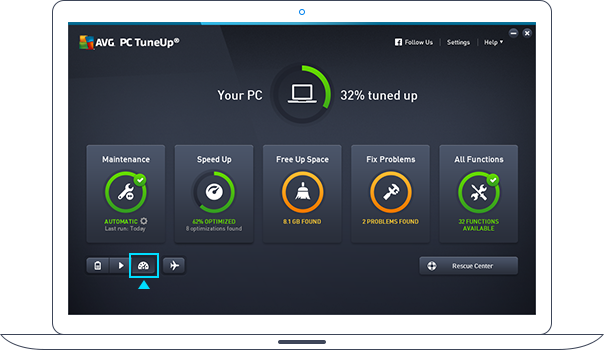 Here's the cure: Our 2017 release of AVG TuneUp comes with a complete reboot of its patented 'Programs-On-Demand' technology. It puts draining programs into a smart Sleep Mode and reduces their impact on PC performance, battery life, network and storage to nearly zero. Programs aren't the only things that can slow down your PC. Windows has many hidden parts that constantly beg for your PC’s precious resources. Using Turbo Mode can stop Windows features from slowing down your PC. On the main dashboard, click on the Turbo Mode (gauge icon) button in the lower left corner. You’ll be asked a few simple questions about what you want to turn off. You can also choose to set Turbo Mode on permanently, or only for when you need to squeeze out that extra bit of power. TIP! If you don’t know what some of these features do, just hover over the individual icons for a detailed description. Turns off more than 70 hard-to-find & often unneeded features in Windows® such as Media Player sharing, pen recognition, or remote assistance processes. It’s simply the best tool for above-average performance when designing, video editing, gaming, or programming whether you use Windows 10, 8, 7, Vista, XP SP3. Your PC should already be running faster. Want more? Check out our Ultimate Guide to speeding up your PC.